The highly touted “Battle of New Orleans” was by all accounts a disappointment. The flaggers’ desire to pre-emptively name a “battle” where one would not occur, and to nevertheless claim victory is evidence of a strategy at play by the far-right that emerged after “The Battle of Berkeley” last month. That same strategy is now in play with many along the racist right, including one of Sunday’s event attendees, Brad Griffin, who writes under the pen name Hunter Wallace. As Griffin was growing apart from the League, another native of the South, Richard Spencer, was gaining notoriety for his promotion of identitarianism, a reactionary right-wing political ideology notable for its adoption of the language of liberalism as a means of disarming opponents. The appeal of identitarianism to Griffin — a bookish, overweight forum-dweller with a liberal arts degree who spent years attempting to cut it in a blue-collar movement — is apparent. The biggest problem was the divide between Richard Spencer’s message and the people the League claims to represent: rural southerners. While Spencer was gaining small numbers of followers at colleges on the West Coast and on the Eastern seaboard (north of the Mason-Dixon, of course), his message didn’t stick in the southeast, and more particularly the racist right of the southeast, notorious for its ambivalence toward academic institutions. As it turns out the bridge between southerners and identitarianism would come in the form of Donald Trump’s incendiary pseudo-populism during the 2016 presidential campaign. Trump swept the Deep South, confounding Michael Hill and others who believed the bible belt would never follow a philandering New York real-estate mogul. “Some members (and former members) of The League have eloped with the alt-right, caught up in all the excitement of Trump's Presidential victory. This is nothing I didn't expect, especially from some of our younger members. Griffin was unswayed by Hill’s admonition, seeing in the alt-right a larger platform and more opportunity to move beyond the League’s staid street protests and conferences in a rural outpost. This has been Griffin’s goal since the election, and he has furthered it by writing for Richard Spencer’s alt-right blogging platform, expanding the views on contributors on his own Occidental Dissent, and partnering with the The Right Stuff (TRS) southeastern offshoot, Identity Dixie to host the Atlanta Forum. Griffin’s vision for “Southern Nationalism” lies in shaping it into a component of the existing identitarian movement, not an independent ideology confined to “rural Christian Southerners” as Hill would have it. 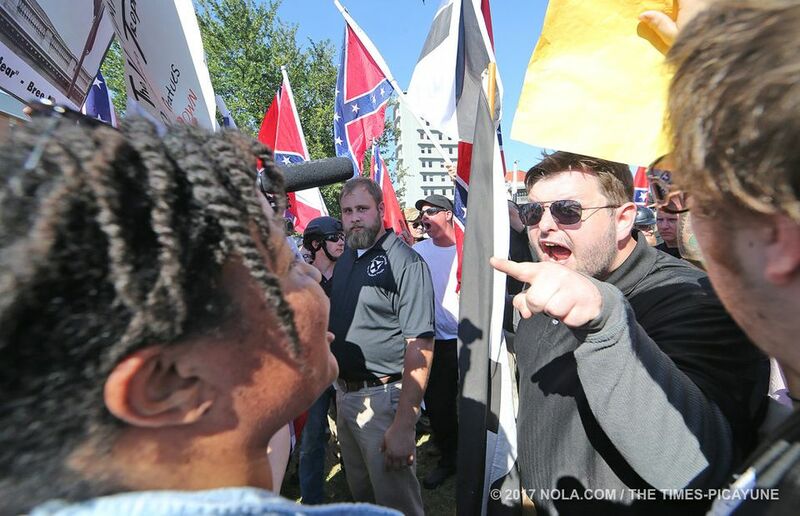 In New Orleans, Griffin saw an opportunity to promote his project by emulating another Spencer disciple and rising star among the alt-right, Nathan Damigo. Damigo is an ex-con who punched an unarmed woman before fleeing into a crowd at protests last month retroactively dubbed “The Battle of Berkeley.” In the aftermath and through a series of tightly edited videos and dubious photoshop jobs, Damigo and others on the “alt-right” asserted that Damigo was instead performing honorably as a trained marine veteran by identifying the 95-pound woman as a “threat” and “neutralizing” her. Griffin stood in the crowd at the SDF’s Kentucky debut in plain-clothes while Hill and company paraded around in would-be tactical outfits. Although Griffin has expressed a newfound tolerance for militant posturing, he clearly is unwilling to participate in it. The warming of relations between Griffin and Hill should not be mistaken for reconciliation, but Griffin’s recognition that if he is to carve members out of the dwindling neo-Confederate movement, Hill’s group is a useful tool. Griffin, for his part, heavily promoted the “Battle of New Orleans” well in advance. Never once did Griffin acknowledge that, Johnny Horton ballads aside, the clear distinction between what happened in Berkeley and what he wanted to happen in New Orleans was that Berkely was named a “battle” after brawls broke out between Donald Trump supporters and Antifas. Garon Archer defending his heritage. Between the restraint of the crowd and the coordination of the New Orleans Police Department, the only violence at the “Battle of New Orleans” occurred when a League of the South member punched out a cosplaying Trump supporter from California. Griffin’s treatment of the incident is ripped cleanly from one man's playbook: Nathan Damigo’s. The entire incident is strikingly reminiscent of the treatment afforded Emily Rose Marshall after Damigo flung himself at her in Berkeley. Just as with the creation of the “Moldilocks” meme, Griffin quickly touted the “Alt-Cuck” as a digital punching bag for the alt right after the “Battle of New Orleans." 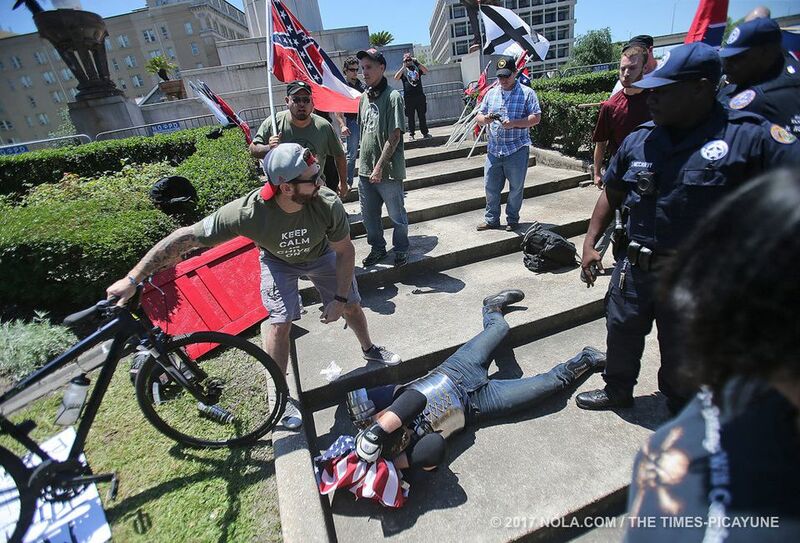 Visible in a shot of the incident from the Times Picayune, Griffin, again clad in street-clothes, films the “Alt-Cuck” crumpled on the ground for his audience where one-time LOS Chief-of-Staff Michael Tubbs stood by, dressed for battle but arms crossed. It’s a fitting image for the future of the League and Griffin’s relationship to it.